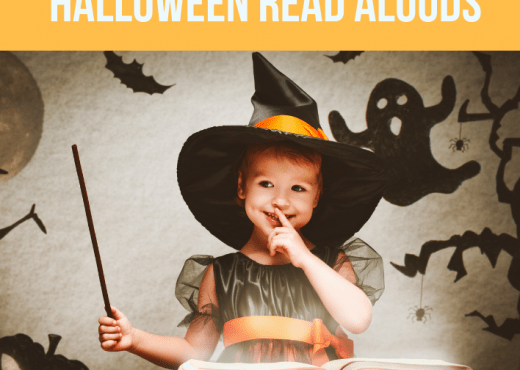 I’m linking up with Sweet Rhyme and going back to the blog archives for this post. I originally linked up with 4th Grade Frolics for Monday Made It on August 4, 2013. 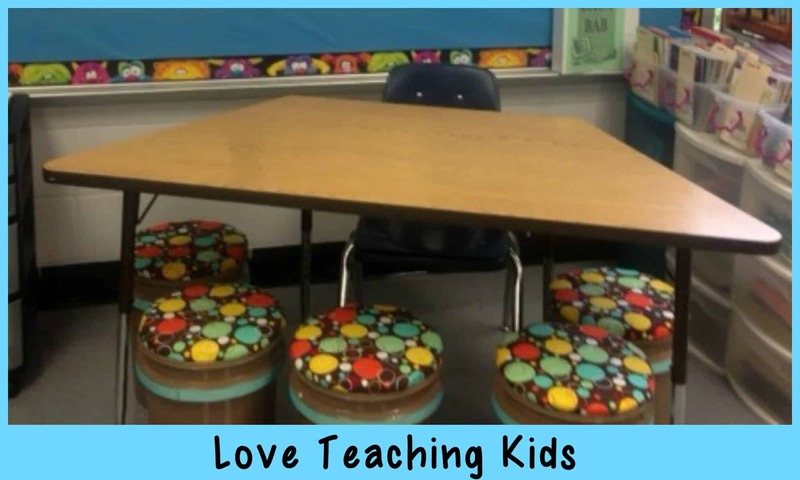 I made Paint Bucket Seats for my classroom. 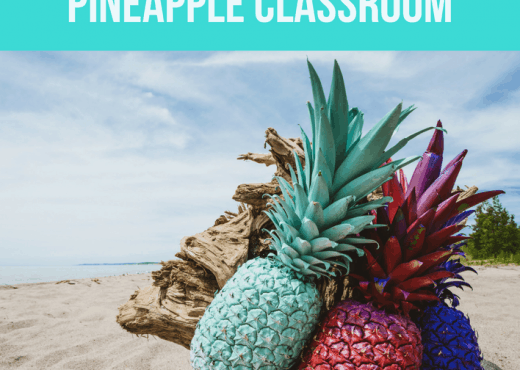 I have really loved using the buckets in my class. One of the problems I had was with the seats. The spray glue came off. I think I will try using the glue gun to reattach the seat to the top of the bucket. I haven’t really had much problem with chipping paint. There are a couple of scratches on the bucket but, not too much. I know some of my coworkers had some problems with scratches. You could always spray paint the buckets again. 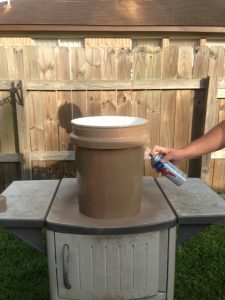 If you don’t like spray painting you could just buy buckets that are already a color you like and maybe decorate them another way. I did not have any problems with my 3rd graders sitting on them. I even sat on them often and I am much bigger than a 3rd grader. It was easier for me to fit the paint bucket seats around my small table than using chairs. We don’t really have any extra chairs to use. They were easy to put away when I didn’t need them. Below are the directions I used for making the chairs last year. I made six paint bucket seats for my small group table in my classroom. 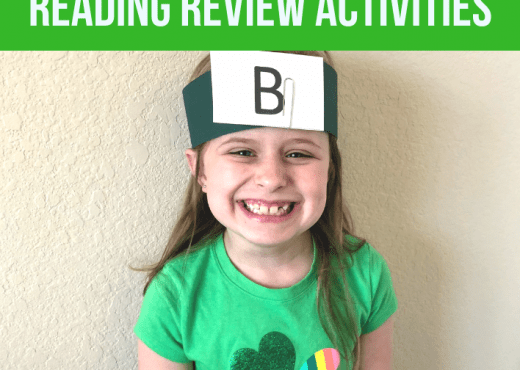 I found this great idea on Pinterest from Hangin Out in Third Grade (this link doesn’t seem to work anymore). I needed something smaller than chairs to fit around my small group table. They were super easy to make and I think my husband had more fun making them then I did! 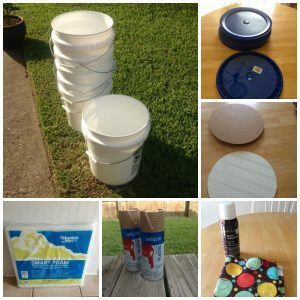 Materials: 6 five gallon paint buckets and lids (they have blue and grey at Lowes), 6 circle boards, foam, spray paint, spray glue, glue gun, material, and ribbon. Step 1: Take the handles of the buckets. Spray the buckets with spray paint. I used spray paint made for plastic. It took 2 cans for 6 buckets. If you have a happy trigger finger you might need to buy an extra can. 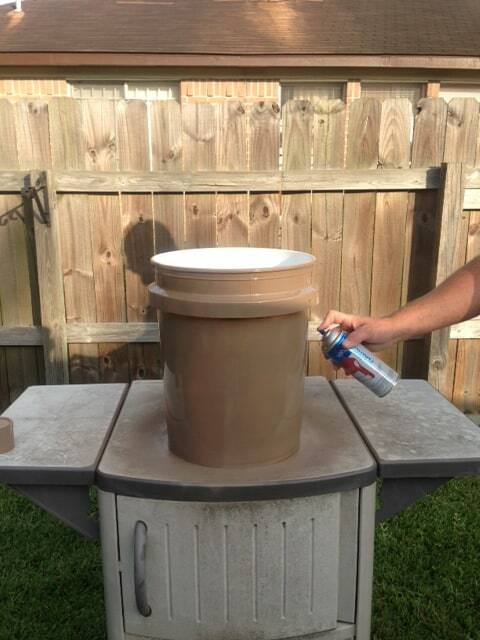 Make sure to spray paint the edges of the lids also. I taped them off with newspaper and painters tape so I wouldn’t spray the top. (My husband said the glued wouldn’t stick to the spray paint. Not sure.) I let them dry overnight. If you want to skip the rest of the steps you can also just order bucket lids with a seat. They are called Bucket Lidz and they are sold on Ebay for 39.95 for 6 lids. 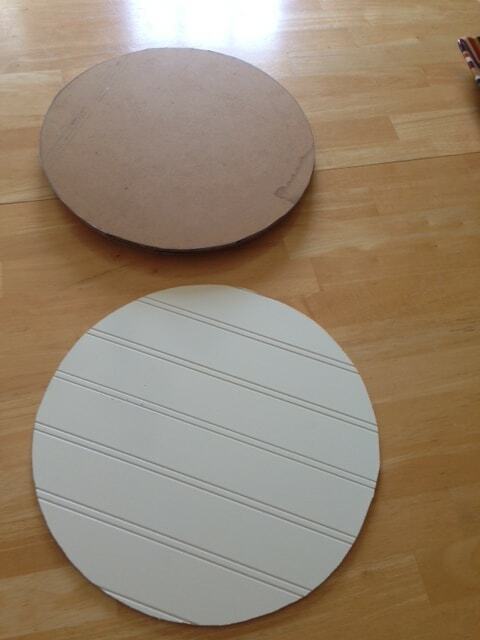 Step 2: Cut the circles out of particle board. We had some left over Wainscoting in our garage so we used that instead. My husband just took the lid and traced a circle around the Wainscoting and used his jigsaw to cut them. 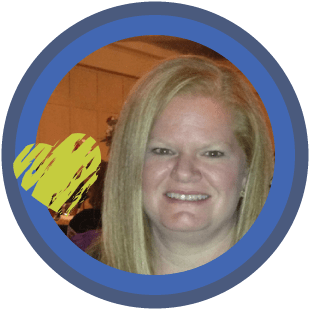 I read on Hangin’ Out in Third Grade’s Blog that she got her circles precut from Hobby Lobby, but I couldn’t find any there. Step 3: Now it is time to add the foam. The foam I bought was really thick so I split it in half. Then I placed the circles on the foam and traced them. One of the boards hung over but I just used them scraps to piece it together. Step 4: It is time to take the circles and glue them on to the boards. I used the adhesive glue. It only took a few minutes to dry. Step 5: Finally its time to attach the fabric. I bought 4 feet of fabric. Cut out a square and attach it to the foam board. I used a glue gun to glue the fabric on the back. Make sure to pull the fabric tight before gluing it on the board. 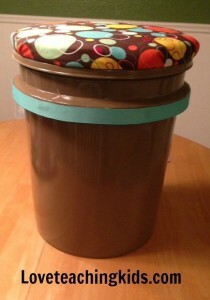 Step 6: Attach the fabric boards to the lid. I used the spray adhesive again to attach the lids. Let dry and then snap on the buckets. I also added trim around the bucket for more color. I had a great time making these buckets. As you can tell my husband helped out a lot. We finished steps 3-6 in about 2 hours. I hope these directions were helpful. If you have any questions or concerns please comment below. Did you ever find a solution for attaching the cushions to the bucket? I’ve tried hot glue, super glues, and velcro and they still come off of the buckets. I’d love any ideas. I have used the spray adhesive. That seems to work. nice post about paint bucket seat. good job, thank for share ! 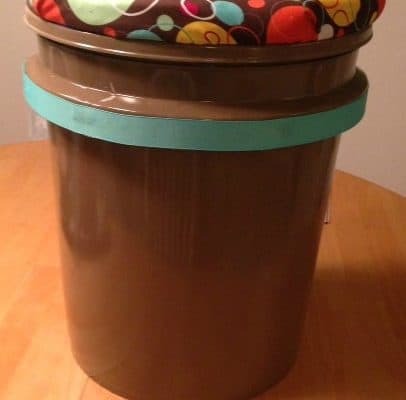 What if you used Duct tape to decorate buckets instead of paint? Duct tape is a great idea!